The Rebel Sweetheart. : Make Home Cleaners with the Kids This Summer. Make Home Cleaners with the Kids This Summer. 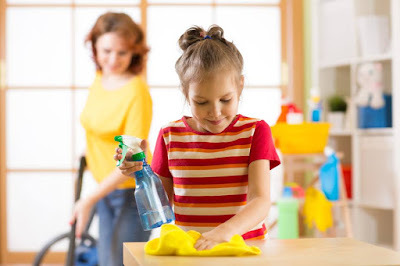 You have two tasks this summer, keep the kids busy and keep the house clean. Probably not always in that order. Why not keep the kids busy by creating a fun, sensory engaging activity that also helps keep the house clean? You know that sounds great! Want to know what makes it sound better? They will all be green home cleaning products! You’re going to have the kids make home cleaners that aren’t filled with harsh chemicals. Occupied kids. Clean house. No killer chemicals. Mom scores with the summer hat trick! Get the spray bottles ready and the kids lined up on the patio table. It’s time to make some green home cleaning products, Portland style. Here are our three favorite greenhouse cleaners the kids can help make. Peppermint shower spray is a natural cleaner that fights icky shower mildew and shower scum. Once you have the mixture, keep a bottle in every shower and spray it down after use. You’ll love the lingering smell and feel great about keeping the shower clean without much effort. Mix 1 cup of water with ½ cup of rubbing alcohol. Add 10 drops of peppermint essential oil. Put it in the spray bottle. Shake to mix. That is it! With the shower becoming such a happy spot in the house because of the new cleaning spray, you’ll want to expand to have the entire house clean with happy smells. This disinfectant cleaner is all-natural but truly does kill off germs. Mix ¼ cup of white vinegar with ¼ cup of rubbing alcohol. Add 1¼ cups of water. Then add 15 drops of peppermint and lemon essential oils. Again, vodka can be substituted for rubbing alcohol and lavender can be substituted for lemon. Add actual lemon rinds to the mixture for added effect. To use the disinfecting cleaner, spray surfaces, allow it to sit for 10 minutes and then wipe away. For best results, us a microfiber cloth. Note: This spray is not for granite or marble. The vinegar may actually etch the surface of these stones. If you don’t want to spend an arm and a leg on that fancy stainless steel cleaning solution, here is a cost-effective solution that really works too. And the ingredients are almost always in stock in the kitchen, because you really only need two things: olive oil and paper towels. Rather than have the kids make this, challenge them to see who can get a better reflection in the refrigerator door. Simply put a quarter-sized dab on a folded paper towel. Allow it to soak into the paper towel and then start at the top of the stainless steel appliance, applying the oil with the grain of the stainless steel. Work from left to right. Once you’ve applied the olive oil to the entire appliance, rub away any excess. Buff out the finish with a paper towel or use a microfiber towel for a real sharp shine on the stainless steel. For the days when the kids are busy at the pool, let the professionals do the dirty work. Get an estimate now for the best green house cleaning service in Portland. I'll try making a peppermint shower spray. Thanks for sharing! WOW, great ideas! I haven't tried asking the kids cleaning our home but maybe now I will. I am scared they might get sick because of the chemical cleaning materials we usually have around. Thanks to you, we can try a different approach now. I use home cleaners like vinegar mixed with baking soda. Vey efficient cleaner plus its affordable. Summer or not, my kids have household chores to do. They are in the right age to do these kind of stuff. It would be a great training for them. Mine are a little too small for this, but that peppermint shower spray sounds amazing! I love the smell of peppermint! Same as Mitchelle said. During the summer we have the kids help out, and if this includes making the cleaner, then so be it! I'd love to try a peppermint shower spray. That sounds so much better than bleach (which we use now)! I don't think I've tried making cleaning products with the kids. That's a lot of fun and it's a great way to encourage them to do chores as well. I haven't heard of the peppermint shower spray but since I like the smell, I'll gladly give it a try. We try to use natural cleaning products at home as the heavy duty cleaners can be quite toxic. These are all awesome green cleaners the kids can help make and even use them which is a plus. The disinfectant cleaner is something I am going to make and use lavender essential oil for one bottle and lemon for another. Thanks for sharing the recipes. and the idea. Although I do teach my children how to do household chores, I'm lucky they're great and love to help out, they're old enough now so I don't have to elaborate on what they need to do, they just figure it out. Foodie Goodie | Bill's Bulgogi Burger. Five Expert Tips for Hiking with a Baby. Everyday is D-Day with Forti-D!